Herrera is batting in the eighth spot Sunday against the Mets, Jim Salisbury of NBC Sports Philadelphia reports. Herrera finds himself in that spot for the first time since his rookie season. His hot start means his batting line is still a respectable .268/.321/.442, good for an above-average 105 wRC+, but he's hit just .208/.274/.325 over his last 20 games. 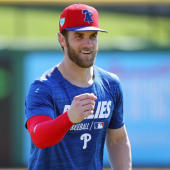 Streakiness is nothing new for the Phillies' center fielder, but as with all streaks, it's difficult to predict when he'll escape his slump.